Over the last decade Cambodia has experienced dynamic growth and development, shaking its image as backpacker country through a boom of exceptional five-star boutique hotels. A new kind of tourist has emerged, seeking to combine the exploration of Cambodia’s cultural treasures with luxury stays in lesser known corners of the Kingdom. From thatched bungalows and eco resorts on pristine beaches to a designer tented retreat on the banks of the Chao Phraya River, the development of this opulent tropical-themed accommodation is changing the luxury outlook for tourism in southeast Asia. Celebrated hotel designer Bill Bensley has completed an ambitious project called Shinta Mani Wild, situated a three-hour drive west of Phnom Penh in Cardomom National Park where guests have to complete their journey by arriving on a zip wire, the adventurous theme continuing to the fifteen sumptuous safari-inspired tented suites nestling in the jungle between waterfalls. Beautiful coastal and island resorts of the Cambodian Riviera are mostly designed as luxurious ecological escapes and quickly growing in popularity. In the Koh Rong archipelago, on the enchanting island of Koh Russey, is the minimalist and chic Alila Villas, architecturally inspired by the Krama, a patterned cloth widely used in Khmer life which perfectly fuses the natural landscape with the interior. Situated by the river in the heart of Siem Reap’s historic area is Angkor’s latest designer property, Treeline Urban Resort, perfectly located to take full advantage of the city’s growing art, food and cultural scene and offering an arts lounge and bar with rooftop pool overlooking the river. Phnom Penh is also making the most of this cultural boom with the opening of Rosewood Phnom Penh, the city’s first ultra-luxe hotel with its stylish suites and choice of 5 dining venues and unbelievable views from its rooftop bar. The hotel occupies the top 14 floors of the Vattanac Capital Tower, the city’s most iconic modern structure and symbol of the new Cambodia. The huge surge in popularity is not restricted to luxury hotels, as fine dining, exclusive spas and trendy sky bars open all over the city. 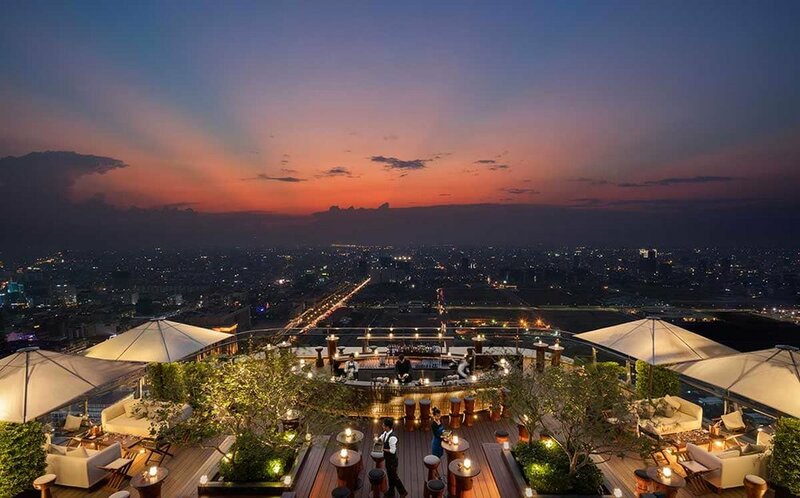 A sunset cocktail at the vibrant sky bar Sora with panoramic city views or indulgent warm stone massage at the brand-new Samantha Spa are hip and happening.